1. As at 31 December. 2. 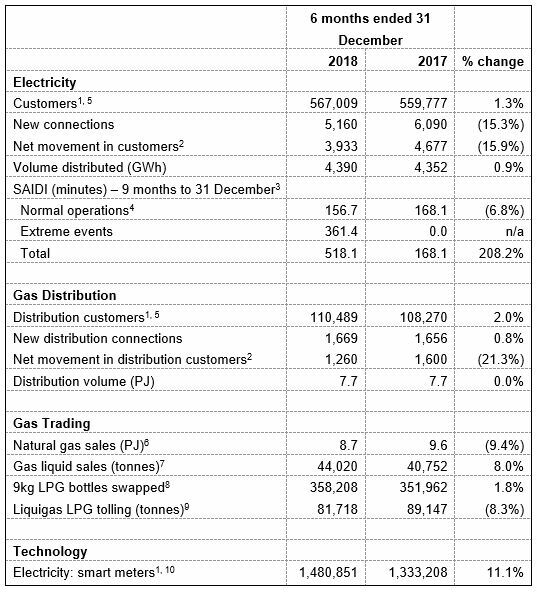 Net number of customers added during the period, includes disconnected, reconnected and decommissioned ICPs. 3. SAIDI (minutes) for the 9 months ended 31 December 2018 is an unaudited value and subject to change. 4. Normal Operations SAIDI includes the impact of 7 Major Event Days at the cap of 3.37 SAIDI minutes for each event. 6. Excludes gas sold as gas liquids. These sales are included within the gas liquids sales tonnages. 7. Total of retail and wholesale LPG and natural gasoline. Includes wholesale volumes from Kapuni and retail volumes via OnGas. Product sold from Kapuni to 8. OnGas is counted twice for the purpose of this metric. 8. Number of 9kg LPG bottles swapped and sold during the year. 9. Product tolled in Taranaki and further tolled in the South Island is counted twice for the purposes of this metric. 10. The number of smart meters deployed as at 31 December 2018 includes 146,062 meters managed but not owned by Vector (31 December 2017: 118,961).